Turning metal on a wood lathe is possible, even though the wood lathe is not designed for it. Lathes are designed specifically for either woodturning or engineering purposes, rarely both. Heavily-built engineering lathes work better than wood lathes. Their tool holder rigidly clamps the cutting tool and moves mechanically. 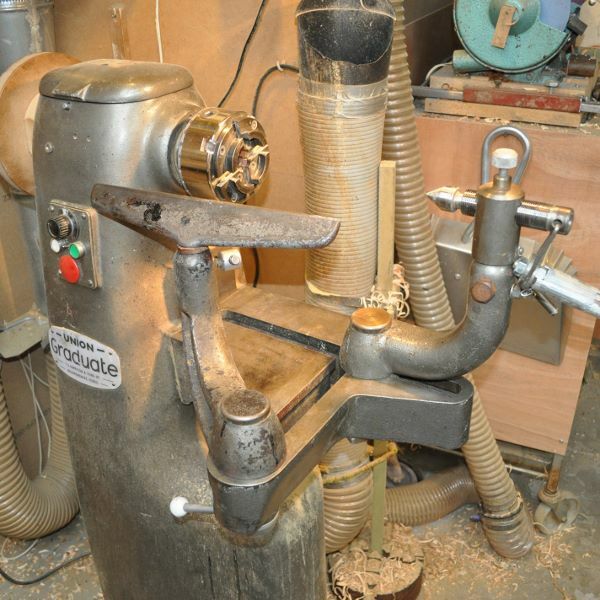 But if you don’t have an engineering lathe and aren’t too ambitious, you can turn many small items in brass, aluminium or even steel freehand quite successfully on a wood lathe. 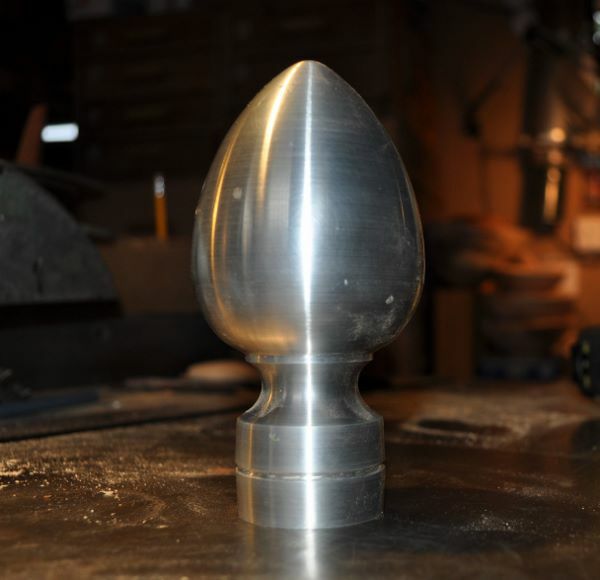 The finial shown above was turned on my Graduate Shortbed lathe, mainly using a small gouge. It was threaded onto a bit of 12 mm studding held in a chuck, with tailstock support, and sanded to an acceptable finish. It is about 5 inches tall. There are problems to overcome. Holding the tool so that it cuts steel is difficult. The hardness of the metal resists the cut, and the cut is very liable to ‘chatter’. This is vibration that leaves a rough or ridged surface on the work. Working freehand, accuracy is harder to achieve. Without a tool slide, accuracy comes from the turner’s skill. Making true cylinders or flat surfaces accurate to a thousandth of an inch freehand is not easy. But many items don’t need such precision. Interrupted cuts, such as turning the corners off something, are particularly difficult freehand because it is hard to control the cutting tool. It is risky, too. Some wood lathes have a proper slide rest as an accessory. Woodturners are familiar with the problem of chatter. When turning metal on a wood lathe it is hard to avoid. To prevent chatter, you need a strongly built lathe, with good bearings. It must hold the workpiece firmly, with minimum projection from the headstock. For example, modifying a drive centre while it is in the spindle taper is easy. A similar job held in a chuck is harder, because the metal can move away from the cutting tool. Use tailstock support whenever possible. A Jacobs chuck will hold small items. Light cuts using a robust and sharp tool, with minimum projection over the toolrest, should then produce an acceptable result. You can use a high speed steel woodturning scraper or a graver. A graver, which you can easily make yourself, was traditionally made from square section tool steel with a diagonal flat, leaving a long point at one corner. You could convert a triangular or square file, but a high speed steel tool bit would be better. A round high speed steel bar ground with a pyramid point would work. It would be similar to a woodturning point tool, but with a more obtuse point. Use a graver a bit like a skew chisel. Its edges (not the point) can plane off long, thin curly shavings from steel. Brass likes tools with zero top rake, so responds well to scrapers. Tools leave a polished surface on brass. Aluminium turns with a graver or even a small short-beveled bowl gouge. Cutting speeds are lower than for wood, but because only small items are possible, the normal low-speed setting on the lathe is probably OK. Some metal alloys are more free-cutting and ‘turnable’ than others. A file will shape the item and remove chatter marks if necessary. Even on a lightweight lathe you can make simple shapes in steel using a file or a rotating grinding wheel held in a drill chuck. Turning metal on a wood lathe is tiring, particularly with steel, because the tool must be held firmly up to the work. It helps to use a pivot pin in the toolrest to lever the tool into the work. This gives more control. If the workpiece is held rigidly, the pivot pin can help prevent chatter too. A heavy cut can increase it. Turning metal freehand is hazardous, therefore precautions are necessary. It is essential that the workpiece is secure in the lathe. Chunks of metal flying out of the machine are even more likely to do you harm than are lumps of wood. Eye protection is a must. The swarf is sharp and hot – wood chips hitting your hand are annoying, but metal swarf can cut. Long strands could even catch your fingers and drag them in. Never clear away swarf while the lathe is running. Turning with a scraper can make chips like little needles. They can get in your skin like splinters. But gloves are risky around moving machinery because they can catch and drag your hand in. Thin ‘rubber’ gloves that tear are safer. A bad dig-in could wrench the cutting tool badly enough to break it and perhaps cause injury. A file thrown back by the chuck jaws can injure you. They must always be used with a proper handle to stop the tang impaling your hand. This post is about dust extractor maintenance. It’s very easy to buy a dust extractor and forget about it. They are simple machines, but problems can grow slowly, so suction declines without you noticing. Not long ago, I made some wheels out of a commercial cutting board, one of the thick ones used in restaurants or on deli counters. I cut some squares from it with the bandsaw with no problems at all. I put each one in my self-centring engineering chuck and turned it to size and shape. A flat bit in the drill press made the holes in the middle. Back on the lathe mounted on a wooden mandrel to complete the turning. Job done. The plastic material, that I think may be polypropylene, turned very easily with a negative rake scraper, leaving a smooth, shiny surface off the tool. The only problem was the shavings. Long ribbons of plastic wound round the chuck, the mandrel and everything else, with the loose ends flailing as the lathe went round. So although there was no dust, I put the dust extractor on. Later, it seemed to me that suction at the extractor inlet was not as good as it once was, so I cleaned the filter cartridge. This was a job I had been meaning to do for some time. There was lots of fine dust in it, blocking the pleated filter. I took it outdoors and used a brush and compressed air to get as much dust as possible out. I put it all back together and switched on. Much better! But was the suction yet good enough? Perhaps there was a blockage somewhere. My extractor is a cyclone unit, and at the outlet of the fan housing there is a grid to stop people putting their hand in and touching the spinning fan. I dismantled the ducting close to the housing to check it. Sure enough, long ribbons of plastic had passed through the cyclone and blocked the grid. It was surprising that air could get through it at all. I knew what to look for, because once before when re-configuring the ductwork, I found the remains of a plastic carrier bag blocking the grid. Like the bag, the bird’s nest of ribbon was easy enough to remove. But this time I did my risk assessment and decided that although the grid removed one risk, it created another. The first risk was negligible to anyone with any sense, while the second was significant. So the grid had to go. I removed it, put the ducting back together and switched on. Now the suction is back to what it ought to be. These are not the only times I’ve come across a problem like this. It’s possible for long splinters or other objects to get stuck at a bend so shavings build up, or for debris to accumulate at a low spot. And filters clog up from time to time. But often the drop in suction goes unnoticed, even if there is a vacuum gauge to check it. So my recommendation is to make a point of scheduling maintenance, and to check suction at your dust extractor often. Whether you remove the safety grid is up to you. An objective way to measure suction would be useful. I shall have to consider a vacuum gauge. One kind of centre finder on the market has a slot for a pencil to mark intersecting diagonals. These work well on squared timber, but are a bit slow to use on a batch of items. Another kind has a blade. You position the blank, tap it so the blade makes a diagonal line, then repeat. I’ve found that this type can easily start splits in the wood, and needs the end of the blank cut square. The centre finder I used for a long time is simply a small wooden block. The block has a hole drilled that is a push fit for a short pencil. The hole is off centre. By turning the block on different sides there is some height adjustment. To use it, I put the spindle blank and the pencil block on a flat surface and mark a line across the end of the blank. Then I flip the blank 90 degrees and repeat to do all four sides. The result is a small square marked on the end of the blank, from which I can easily find the centre by eye. This is not super-accurate, but good enough for most purposes, and it is quick. I have several blocks in different sizes so I can pick the one most suited to the size of the spindle blank. The blank need not be square and the pencil block can mark cylinders equally well. The point of a nail works too, and stays sharp. I’ve now made an adjustable version of the pencil block, with a pivoting arm to hold the pencil. The hole for the pencil has a slot through it and a pinch bolt to lock it. To find the centre of a bowl blank, I usually use a hardboard disc of appropriate size. I have a lot of these in different sizes for marking out bowl blanks, and each has a small hole in the middle. I just lay one on the blank, and place it quite accurately by eye or touch. Then I mark the centre with a pencil through the hole. When I need more accuracy, I use a chuck insert centre finder. This is a short dowel with a steel point in one end. I turned the insert to fit inside the body of my engineering chuck. I put the chuck on the bench and adjust the jaws to be a sliding fit on the spindle blanks. The blanks must be square or cylindrical. A tap on the end of the blank pushes it onto the point to mark the centre. This is a good method to use when part of the finished item needs to be left square. The skew chisel. Learn to use it and see what it can do. Lots of woodturners fear the skew chisel. Skews dig in alarmingly, seemingly without any warning or provocation. Some people don’t use them at all. But can you really call yourself a woodturner if you can’t use a skew chisel? It’s perhaps the most useful and versatile tool of the lot for spindle turning, so it is worth persevering with it. Just watch Woodturner21’s videos on YouTube to see what the tool is capable of. You probably already have some idea of how to use the skew chisel for cutting beads and planing a cylinder. You can find the basic principles in turning books and DVDs and I don’t mean to repeat them. All I can tell you is what you already know – that you need lots of practice – and show you how to get the most from it. First, tune up your skew chisel. Although you can use different grinds, the default has a skew angle of about 70 degrees and a bevel length of about 1.5 times the thickness of the tool. A long bevel makes it easier to see what you are doing, though can make the chisel cut in deeper when you get a catch. Make sure the edge and the points are really sharp, and not rounded over. A long bevel and straight cutting edge are easier for sharpening on a diamond hone. But it’s OK to use either a straight edge skew chisel or a curved one straight from a grinder. Platform sharpening is probably the easiest method. Try the edge on your thumbnail – if the edge or the point slides without biting in, it’s blunt. Make sure you keep the chisel sharp all the time you are using it. You must grind away the sharpness from the long side edges of the tool so they slide easily on the tool rest. Nowadays you will probably find this has been done at the factory if you buy good quality tools. If possible, use a strong, rigid skew chisel of about 10mm square to practice beads (dealers sell these as ‘beading and parting tools’. You can easily grind it to a skew angle), and one about 18mm wide for planing. Of course other sizes work perfectly well. But a short edge gives less scope for catching on a bead while cutting on the point, and a wider tool helps keep the long point clear on a cylinder. Now check your tool rest. Make sure it is smooth. Rub it with a bit of wax to cut friction. Set it a little higher than for gouge cutting. This puts the skew’s handle in a more convenient place for you. Have the lathe running slowly so you can see what is happening at the point of cut, and you don’t feel threatened by the spinning wood. Put on your face shield, just in case. Later you will probably want to use higher speeds. If you are nervous, use a conical fixed centre (one without any teeth) in the headstock and a revolving one in the tailstock. Make a pilot hole about 6-8 mm wide and deep in the headstock end of the blank. The cone centre will give friction drive only, with nothing else forcing the wood round, and is safer than holding the wood in a chuck. You can adjust the tailstock until the friction is strong enough to drive the blank but it will stop turning if you cut too deep or have a bad dig-in. A ring centre will also drive the work safely, and doesn’t need a pilot hole. Practice on soft timber. Start with a blank you have roughed down into a cylinder of about 40mm diameter and about 150mm long. You may find bigger pieces intimidating, and long or thin ones whippy, neither of which is helpful. Choose a blank that is straight-grained and without knots. Don’t try to make any specific item at first, just keep making beads and planing cylinders. Make beads of about 12-18 mm wide. Use a parting tool first to make a clear space either side of each bead for the skew chisel to work in. Use the short point of the skew chisel for cutting beads, although it is possible to use the long point or the edge. Stick with the short point until you are happy with it – later you will try the long point and may end up preferring it. I think the short point is easier to start for many people. The first few times, use a scraper to make a shallow bead shape that you can then follow with the skew. The scraper seems easier, but don’t be tempted to keep on with it. When you see the difference in the surface the skew makes, you will understand why. Then, with the lathe switched off, present the skew to that rounded surface, first at the top and then moving down to the bottom of the curve, keeping the point in its proper cutting position as you go. The chisel will begin almost flat on the rest and twist over. After you have made some shallow beads, try some that are fully semicircular. On these, the tool will end on its side. See how you have to move the tool to keep the point in the right place. Repeat the movements round the curve, so your muscles begin to learn the action. Although you will be cutting with the point, the bevel must float (not press) on the cut surface to support the tool. Twist the skew as you go round the curve to keep the point in the cutting position. The edge will be close to the wood, but don’t let it touch. If it touches when the lathe is spinning you might get a catch. When rolling the bead with the edge, the movements are slightly different. When you are ready, switch on and take a cut round the roughed-out bead. Go slowly so you can see what is happening. No rush. As slow as you like, if using a high speed steel chisel. Carbon steel can overheat if kept in the cut too long. Take a thin shaving. Steer the point all the way round the curve, repeating the movements you started to learn earlier. Try for a smooth, even cut and don’t put pressure on the wood. Pay attention to the handle movements. They are what you are practicing. As you try to go round the curve, you may have a tendency to complete the movements either too early or too late. Either will make a poorly shaped bead. Don’t work too long on one bead, cutting too deep into the wood, because if the blank gets thin it will start to vibrate. Start a new one. You may find one side of the bead easier than the other. Concentrate on the easy side first, making half beads, until you understand the process and feel ready to change over. When you get a catch, correct it with the scraper or start again on a fresh part of the blank. This is because the damage can interfere with the free movement of the skew. Planing uses the edge of the skew chisel. Keep the long point up, clear of the wood. Have the cutting edge at about 45 degrees to the lathe axis, because that gives a slicing cut with the shaving coming off near the short point. The key is to keep the bevel floating, without pressure, on the freshly planed surface. It’s easy to let the handle lift a little, and immediately you will get problems. When you can plane a cylinder without problems, you can practice steering the cut to round over the end – this is another good way to make beads. A ball cutting jig can be made from a machine slide. Turning a sphere freehand will test your skill, particularly if you need two the same size. If you want more than one or two and don’t want to do them freehand, you can use a simple homemade or commercial ball cutting jig. I make lots of balls in a range of sizes, and for me a jig that lets me produce them quickly and accurately is essential. The most basic ball cutting jig is simply a clamp to hold a cutting tool, with a pivot to allow the tool to swing through a quarter circle or more, all fixed to the lathe bed. The cutting tool is sometimes adjusted in the clamp, or there could be a sliding adjustment so the clamp itself moves. But every commercial ball cutting jig I have seen is a bit flimsy or lacks easy adjustments. The cutter is usually advanced just by pushing it forward by hand. Sometimes there is no adjustable stop to control the finished ball size. I made a heavy-duty ball cutting jig. It does a very good job cutting balls and can also make hemispherical hollows. It was easy to make, but would not have been so easy if it was not based on scrap parts. The key component is a machine slide such as top slide from a metal turning lathe. These can be obtained from dealers in old tools, or from Ebay. Mine has a rack and pinion lever feed. This is ideal because it is fast to use, but screw feed would be fine. I made the rest of the ball cutting jig from bits of scrap steel. The construction details depend on what lathe and machine slide you have so I can’t give more than guidance. Assembly would probably only involve drilling, tapping and bolting together. If you would like to make a ball cutting jig like this but have never done any work with mild steel before, don’t worry. Think of the steel as like very hard wood. You can cut it with a hacksaw, or if it is thick, drill a line of holes close together and saw through them. Drill the holes with a twist bit in a drill press because it is difficult to drill freehand, even with a power drill. You can cut screw threads in steel with a tap by screwing it into the correct size hole. A locating block (not shown on plan) that fits the lathe bed so the jig can slide along parallel to the bed without sideways movement. This makes locating the pivot point with reference to the ball centre much easier as you can just slide the jig along to the right place. You have to make sure the centre of rotation of the jig passes directly and accurately under the turning axis of the lathe. The short bed on my Graduate lathe has a slot that is offset a little, so I offset the jig to match. The locating block is not load bearing, it just positions the jig before locking down, so wood would do. Next is a pivot plate sitting on the lathe bed. Make it thin, but rigid. The thinner it is, the more clearance space you have and the larger the ball you can make. A steel disc about 10 mm thick and 100 mm across would be ideal. Mine is much thicker, because that is the scrap that I had at the time. A rigid slide support platform sits on the pivot block. The mating surfaces of the pivot block and the slide support platform are the pivoting plane. The ideal for the support platform would be a strip of steel of width to suit the slide, and 12 mm thick. If the strip is too short it limits the ball size unnecessarily. I rounded the end of the support platform to clear the headstock. The clamping plate, guide block, pivot plate and slide platform are all locked together with the pivot pin. This could be a 12 mm or larger steel rod, threaded where necessary. Firmly anchor it in the pivot block. You could screw it into a tapped hole in the pivot block and secure it with thread lock compound. This provides two separate clamping actions – one from below to lock the jig to the lathe bed and another from above to adjust the swivel tension. The pin passes down through clearance holes in the guide block and clamping block. This allows a nut and washer to pull the pivot plate down on the lathe bed, positioned by the guide block and held by the clamping block. Above the pivot block, the pin passes through a snug-fitting clearance hole in the slide platform. Above that are a washer and two nuts that lock against each other to set the pivot tension. The pin should preferably be unthreaded where it passes through the slide platform. This is a bearing surface for the pivoting movement. But even a screw thread should give adequate guidance, assuming the hole is a snug fit. The top of the pin needs to have its centre marked to set it exactly beneath the centre of the ball when in use. I turned a point on mine. If the ball turning jig is not lined up properly, the ball it makes will not be perfectly round. Bolt the machine slide to the slide support. The moving slide carries the tool holder. The tool holder on mine came from another old machine, but you could make a similar one by bolting three bits of steel together. It stands on a raising block to bring the tool to the lathe centre height. Having it a little low allows you to use different cutters, with shims. If the cutter is not on centre height, the ball will not be spherical. You need an adjustable stop for the slide movement. How you do this will depend entirely on what slide and other parts you have. I used a bit of threaded rod with two adjustable lock nuts, passing through a clearance hole in a bit of metal attached to the slide. The cut stops when the metal contacts the adjusting nuts. By counting movement of the nut flats, I can adjust the cutting depth and size of the ball very accurately. The largest size of ball you can make depends on the clearance above the top of the swivel point and the travel of the slide. If you make a ball from a cylindrical blank, the clearance needed is more than the radius of the ball. Even more so if you use a square blank, And you have to allow for projection of the cutter. To use the ball turning jig, position the swivel axis directly beneath what will be the centre of the ball. I normally make hemispheres with the blank held on a screw chuck, so position the swivel pin beneath the face of the chuck. I glue the hemispheres together to make perfect spheres. Advance the cutting bit, an ordinary round-nosed scraper. Pull the slide round to make a cut, then advance the tool for the next cut. When set up, I can very quickly make lots of identical half balls. A ball cutting jig of this kind cannot make a whole ball in one pass. You must hold the blank in the lathe, so the cutter cannot reach all the surface. It could make most of the ball for finishing off by hand. Or you could move the ball in a chuck so the cutter reaches the uncut parts. If you hold the blank in a chuck the cutter could do 75% or more of the circumference in one pass. It would leave just a single chucking spigot. If you hold the blank between centres, it leaves two smaller spigots. A traditional way of hand turning spheres is to put the roughed out ball between two female cone centres. The spigots project sideways for turning off. Using this same method, you could finish the ball with the jig. It should leave a perfect ball if set up correctly. It’s sometimes useful to know how to harden steel. Although it’s possible to do woodturning with very few tools, I can never resist trying something new. Sometimes I buy tools, but often I make them myself. Back in the days before commercial tools were available, turners knew how to harden steel and temper it. They made their own tools out of high carbon steel, or got them from the local blacksmith. The best way to harden steel and temper it is to do it properly by modern methods. This requires the right steel for the job, with careful control of temperatures and timing and the rates of heating and cooling. But acceptable results can usually be obtained using the cruder methods described here. Turning tools are now rarely manufactured from carbon steel, but it is still used for many other purposes. Even for turning tools, it still works as well as it did when the old-time turners made their living with it. You can buy high carbon steel in various grades from steel stockholders, some suitable for hardening in water and others in oil. Scrap carbon steel is easy to find. If you want to harden steel for tool making, springs, files, saw blades, masonry nails, crow bars, cold chisels, woodworking chisels, old screwdrivers, plane irons and many other things are steel that is suitable for reworking. I have used the tines of an old garden fork and the rings from old ball races. Keep in mind that if you put the tool under significant stress, steel that has or may develop cracks is unsuitable. For example, the valleys between the teeth of a file are weak points where cracks can start. If you are using scrap, old steel is often the best choice because some modern steel alloys may not respond well to these basic heat treatment procedures. One way to tell what you’ve got is to touch the steel on a grinder. Lots of bright bursting sparks like a child’s ‘sparkler’ firework mean it is probably high carbon steel. Try a bit of mild steel such as an ordinary nail for comparison. It will also make a lot of sparks, but there will be fewer bursters. The use of the metal before it became scrap is a clue – if it was subject to a lot of stress, the metal is probably high carbon steel. But there is a continuum of carbon content – to be sure, test-harden a piece before making the tool. Ordinary low-carbon mild steel is not suitable for most cutting tools. You cannot harden steel of that kind, and it will not keep a sharp edge. To harden steel, the metal must have a high enough carbon content. The metal is harder than wood, and a cutting edge on mild steel may last long enough for a one-off job. But if the edge is thin it will just give way under pressure. You can case-harden mild steel. This gives it a very thin layer of higher carbon content on its surface. Then you can use it for some light-duty cutting tools provided you don’t grind away the hardened skin when sharpening. To case-harden, coat the metal with a special compound before heating. You can use mild steel as a holder for inserted or brazed-on cutters. To harden steel, you must first make it hot. You can use a magnet to check that it is hot enough for hardening – when the magnet stops attracting it, the steel is ready. More simply, just get it red hot, which is also the temperature needed for hot forging. The bigger the piece, the more heat you will need. If the item is small, you can harden steel using a burner on a gas cooker. You can use a charcoal fire with a blower to supply air. You can do a lot with a reasonably powerful blowtorch. Larger pieces of steel may dissipate the heat as fast as it is applied, never getting hot enough. If using a blowtorch, you can stack a few dry bricks to make an enclosure to retain the heat. A simple forge burning solid fuel or propane is not hard to improvise. There is video on YouTube about making a simple but very effective propane forge. I made a forge that burned anthracite and worked 7/8 inch bar without too much trouble. More recently I made a propane forge using just two insulating fire bricks and a blowtorch, and was able to bend steel strip of about 2 inches width and 3/8 inches thick. If you make two pieces of steel white hot, you can weld them together by hammering. Hotter still, the metal will burn and spoil. But these temperatures are harder to reach with the sort of equipment described. If you want to do any hot forging, you will need something to use as an anvil, a hammer, vise and heavy pliers. You may also need a hacksaw, angle grinder, file, bench grinder and a drill press. To work thick steel, you will need heavier tools and a forge. If it’s hot enough, it’s surprisingly easy to bend steel using a vise or wrenches, or to hammer it into shape on an anvil. You can forge ordinary mild steel in the same way. Some scrap carbon steel is too hard for sawing or filing into shape. You will have to anneal it to make it softer and workable. To do this, the first step is to make the metal red hot. While it is hot, you can forge it. Don’t try to work the metal when it has lost its red heat or it may crack. You have to strike while the iron is hot. After any forging, get the steel red hot again and then anneal it by cooling it slowly. The slower it cools, the better – traditionally the metal was left to cool buried in hot ashes. If using a propane forge, you can just leave the metal to cool in the forge so the residual heat will slow the cooling. You want the whole piece uniformly softened, so try to heat and cool it evenly. When cooled, the annealed steel should be soft enough to file. Check that all parts are soft, then carry out whatever further operations you need. Shape the tool, including rough grinding the edge. To harden steel, heat the part to be hardened bright red hot again, if possible ‘soak’ it in the heat for a bit, then quench it. It’s the rapid change from red hot to cold that will harden steel. You can use various quenching liquids, but a bucket of water will usually do the trick. Plunge the red hot metal straight in, and swirl it about to cool it as rapidly as possible. If the steel warps or cracks when quenched, try using oil instead of water, or use different steel. If using oil, fire precautions are necessary. Use a metal container, not a plastic bucket. The hot steel will heat and ignite the oil, so have a metal cover handy to extinguish the flames. You don’t always have to harden all parts of a tool to the same degree. If it must withstand stress in use, you can leave the bulk of it soft, for toughness and strength, with just the cutting tip hardened. After quenching, the steel should be glass-hard and a file will just slide off it without cutting. Don’t try too hard with the file, the hard metal will soon make it blunt. The freshly hardened tool will be brittle. If you were to use it in this state, the edge could chip or it could shatter. For most purposes, you must heat it one more time to temper it before use. Tempering takes away the brittleness. It makes the metal tougher, but softer. The higher the temperature reached during tempering, the softer and less brittle the steel will become. Each tool has its own optimum compromise between hardness and toughness. Before tempering, clean up the metal using abrasives. You want the steel bright and shiny for this stage. Warm the tool very carefully above, not in, a clean flame. Watch the bright metal surface carefully as it heats up. Let the heat start away from the edge and creep towards it, aiming for a uniform temperature over the surface. The edge and any other thin parts will heat up too fast if exposed to the heat directly. If you let the metal get too hot you will have to repeat the hardening stage. You can repeat the annealing, hardening and tempering without harm to the metal. But too long at high temperature can tend to burn out the carbon from the surface layers. When the colour is right, quench the tool again. It is then ready for final clean up and sharpening before being put to use. Sometimes you need more accurate tempering, for example if you need a larger piece evenly tempered. You can do this by heating the item in an oven at a set temperature, or in oil. You will need a thermometer for these methods. They allow for soaking at the proper temperature, which may give better results.